How Secure Is Your Network? Audit and Test Your Network Security with Nsauditor! 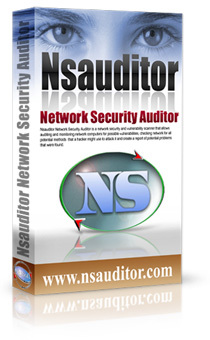 Nsauditor Network Security Auditor - Advanced All-In-One Network Tools Suite! Monitoring Network Computers is commonly done by sending a “ping,�? or test, to each computer or system on the network. Monitoring of networks is implemented based on server and protocol types. To monitor a web server, monitoring software periodically sends HTTP request to get a page. Email servers are monitored by sending a test message through SMTP and retrieving response via IMAP or POP3 servers. As a rule, most of network monitoring systems test server in the interval of from once-per-hour to once-per-minute. Some other monitoring systems also audit and find routing issues which can cause undesirable performance degradation or downtime. This type of network measurement is known as Route Analysis. Another important area of network measurement is Network Tomography. NT studies network's structure, internal characteristics and health of various links in a network using information derived from end point data. Obviously, business and enterprise networks require more serious and professional approach in establishing of effective and reliable network monitoring system. Monitoring of internal corporate networks is a critical IT prerequisite, because its successful engagement can save money, dramatically increase employee productivity, help set up optimal infrastructure solutions and provide safe collaboration environment for the company. You would be pleasurably surprised if you know that monitoring is a valuable asset to office and project managers in terms of overseeing the whole activity within company network. The successful setup of network monitoring system depends on the selected solution of software and hardware combination. Some network monitoring software only scan the network retrieving the data while others also provide possibility to audit and generate various traffic and statistical reports, and analyze the current state of the network system, even suggest optimal solutions to make the situation better. Such software is great asset to the system administrators and thus the more comprehensive monitoring software the better the virtual control over the network. Nowadays IT market is rich in various Network Software Solutions and it makes difficult to choose amongst them. For obtaining an optimal software solution for your network monitoring you might first want to consider such factors as targeted solution, ability to handle voluminous data, ability to generate various reports on system status and security, customizability and of course easy-to use feature. So if you are interested in obtaining a software which comprises all these features in it for your network monitoring and audit you should have closer look at some popular software solutions such as NBMonitor and Nsauditor highly rated by authoritative reviewers. 1. Ease of Use Nsauditor is the easiest to use toolkit on the market. 3. Support We grant you unlimited 24 / 7 support. Network Software Inventory - Software License Tracking Solution! Nsasoft Network Software Inventory is software license tracking solution. The software scans network and displays complete software information! Nsasoft Network Software Inventory is a powerful network inventory software for home, office and enterprise networks. The software scans all computers on a network and generates complete reports about computers software. It is integrated IT Help Desk, Asset management & Software license management solution. Network Software Inventory helps technicians to understand the problems with the software license compliance and the use of unauthorised software in the organization. Nsasoft Network Software Inventory allows to get a complete picture of Orderingd Vs installed software for managing the software licenses. Associate the minor versions and allocate software licenses for all your "Managed Software" in the network. Nsasoft Hardware Software Inventory is a powerful network inventory software for home, office and enterprise networks. The software scans all computers on a network and generates complete reports about computers hardware and software. This information is added to the centralized database and then users can generate reports about each or all of the PCs on a network. The program is agent free and requires no software installed on remote machines. Nsasoft Hardware Software Inventory - Scans network and displays complete hardware and software information! The software can export reports to Tab Delimited Txt File (.txt), Excel Workbook (.xls), CSV Comma Delimited (.csv), Web Page (.html) or XML Data (.xml) file, SQLLite3 Database. Highly recommended for budget-conscious companies looking for a feature rich network inventory tool. Need to track your Internet bandwidth usage? NBMonitor Network Bandwidth Monitor can Really Help You to do it! As a number of ISP’s are now disconnecting customers for using “too much�? bandwidth, knowing exactly how much you’ve downloaded or uploaded in a given month can be very helpful. NBMonitor tracks your Internet bandwidth (upload and downloads) usage, monitors all your Internet, it shows all the active connections you have to the Internet at any given moment and also the volume of traffic flowing through them. NBMonitor displays real-time details about your network connections and network adapter's bandwidth usage. Unlike others, it shows process names initiated network connections and allows you to set filters to capture only the traffic you are interested in.